Happy Weekend! @lunchesandlittles here with a different kind of recipe to share with all of you this time around – dessert! And oh my goodness, this one is amazing. 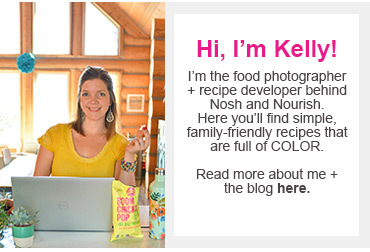 If you remember, my last few recipes have been salad, broccoli bowls, and more salad. Now, I love dessert, and don’t believe that there is anything wrong with indulging yourself every once in a while. But even so, I really don’t like all of the sugar and junk that you often find in brownies and other treats, especially store-bought varieties. But, still I just love dessert, especially cake. So what's a girl to do? Well, last summer was the first time I attempted a vegan cheesecake with soaked cashews. I was so intrigued by the process and the thought that I could make a rich and creamy cheesecake alternative with nuts, and I just had to give it a go. In the end, that recipe was good, but I knew it needed some work. And so I worked on it, and then worked on it a little more (and then ate the various versions all in the name of recipe development, of course)!! 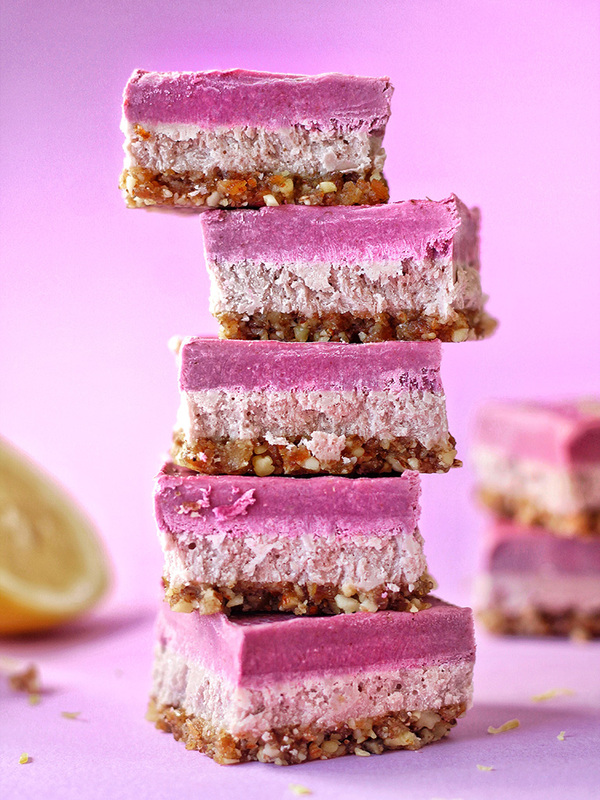 And now, just in time for spring and summer I am sharing my Lemon Berry Vegan Cheesecake Bars that aren’t just beautiful to look at --- they are also creamy, delicious and completely satisfying to eat. 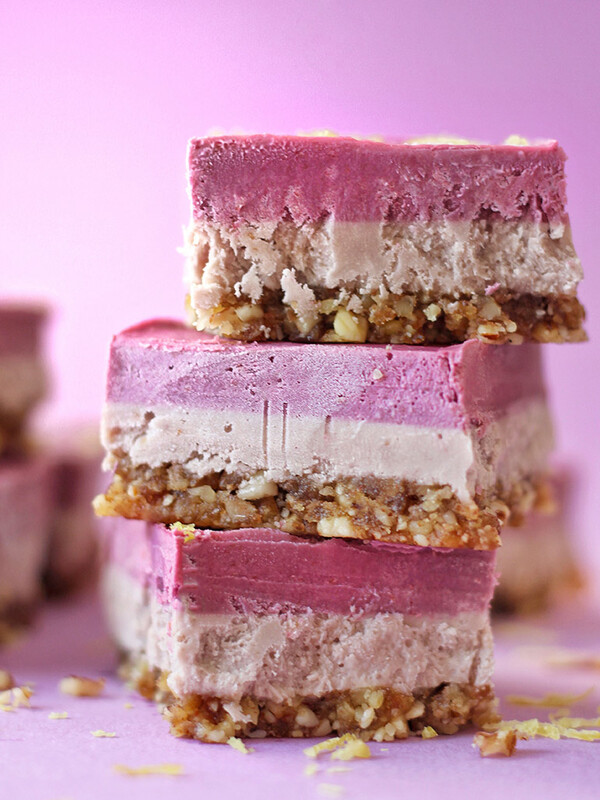 These bars are easy to make (they just take a little patience! ), and they are made from real food. All the color you see is completely natural (can you believe it?!? ), mainly from blackberries! I've also been coloring pancakes with fruits and veggies too. 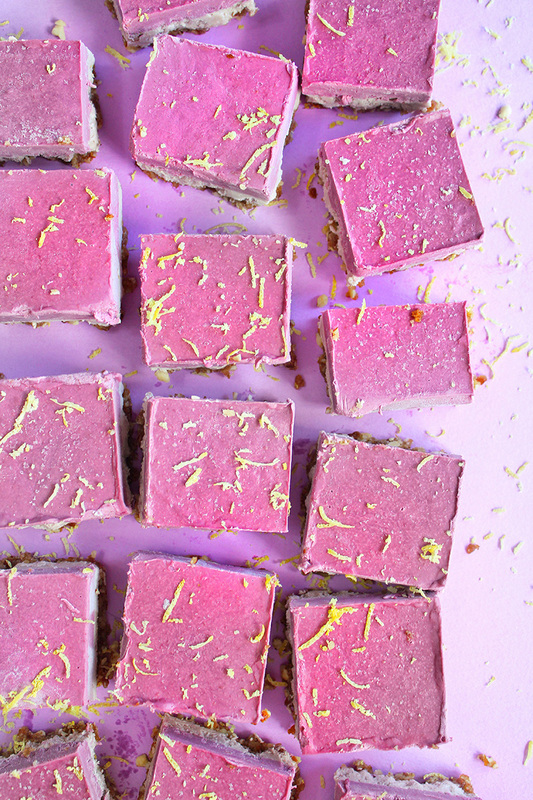 Check out the full recipe below, and be sure to add these Lemon Berry Vegan Cheesecake Bars to your must-make list for spring or summer… Or let’s be honest – both! 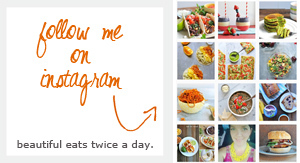 For more delicious, colorful recipes that are both vibrant and nutritious, be sure to check out my feed, @lunchesandlittles, where I am serving up deliciousness on the daily! *you will also need parchment paper and a 9 inch square cake pan. • Line your pan with parchment paper both ways, with enough overhang so that you will be able to remove the bars as a whole once they are ready by simply lifting the paper out of the pan. Set pan aside. • In a large capacity food processor, combine all of the crust ingredients, minus the water, and process until a sticky dough starts to form. Then shut off and add in a little water. * Start with just a 1/2 tbsp and see if it is moldable enough for the crust (you want something that is still clearly made up from pieces of nuts – be careful not to over process). If you need more, add a 1/2 tbsp at a time, up to 1 1/2 tbsp total. • Once you have your “dough” ready to go, press it into the bottom of your prepared pan. Using a separate sheet of parchment paper lay it over the pressed dough and press down on the parchment paper, smoothing out the dough as much as possible. • In a high-powered blender (Vitamix or Blendtec are great options) combine all of the filling ingredients, minus the blackberries and lemon zest and cover. Pulse/ blend for 1- 2 minutes, until completely smooth and creamy. • Next, divide your filling in half (approximation is fine). What is easiest is to just pour half of your filling out of the blender into a bowl, leaving the remaining half in the blender. • Then, add just 3- 5 of your blackberries to the blender. Once again, cover and pulse/ blend until a light lavender color is achieved. • Once crust is ready (frozen at least one hour) remove from freezer and pour the light lavender mixture over the crust mixture. Shake pan slightly back and forth and tap on counter a few times to smooth and remove any air bubbles. Then, return the pan to the freezer for 30- 45 minutes, or until layer is set. • While layer is setting, pour remaining mixture back in to your blender. Then, dump the remainder of the blackberries (most of the pint) into blender. Cover and pulse/ blend until well-combined. The color will be a vibrant purple shade. You can store the blender pitcher in the fridge until you're ready to pour the last layer. • Once first layer is set, pour second layer on top, and again – shake pan slightly back and forth and tap on counter a few times to smooth and remove any air bubbles. Return pan to freezer to set for about another hour. • After an hour’s time with all the layers complete, the dessert is ready to eat! Remove from freezer and let it set out 5 or so minutes before cutting into it. Then cut into small bars, garnish with lemon zest and serve! • Store leftovers, covered in the freezer for up to a week.